Now that the warmer weather is here, you may be enjoying exercising outdoors! 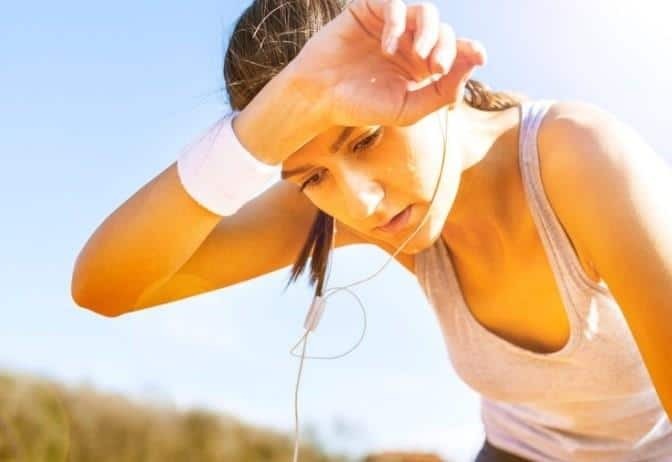 The risk of heat illness increases when you exercise during the hot and humid weather. This is because you may not be able to produce enough sweat to cool your body down and the higher humidity may prevent the evaporation of sweat. As your body adapts to the heat, gradually increase the pace and length of your workout. Also consider reducing the sweat factor of your workout by swapping a heavy cardio session for some resistance training. To avoid the risk of heat illness throughout summer, it’s important to avoid exercising during the hottest part of the day, this is between 12pm-3pm. The cooler early hours of the morning are a good time to exercise when it isn’t too hot, alternatively you can take advantage of the daylight saving hours, exercising in the evenings. It’s important to wear sports clothing that is loose and light, darker colours retain the heat, whilst tighter fitting heavier clothing will also heat you up. Choosing loose light coloured clothing allows the movement of air over your skin, helping to keep your body temperature down. Remember to apply 50 plus sunscreen regularly whilst you’re exercising, especially if it’s over a long period of time. Whack on a hat, the most effective type of hat that can be worn to block out the sun is a wide brimmed hat. Be aware of the heat and listen to how your body is feeling. If you experience any of the below make sure that you find a cool spot as soon as you can. Our Physios are able to provide sports Physiotherapy treatment, to find out more about the services that we provide press this link.